Logan Soelberg, a sophomore middie at Crespi Carmelite, has announced his commitment to attend and play lacrosse at the University of Maryland. As a freshman last season, Soelberg scored seven goals in the Celts’ first seven games before breaking his collarbone. He returned to action late in the season and finished with nine goals and an assist in 10 games. 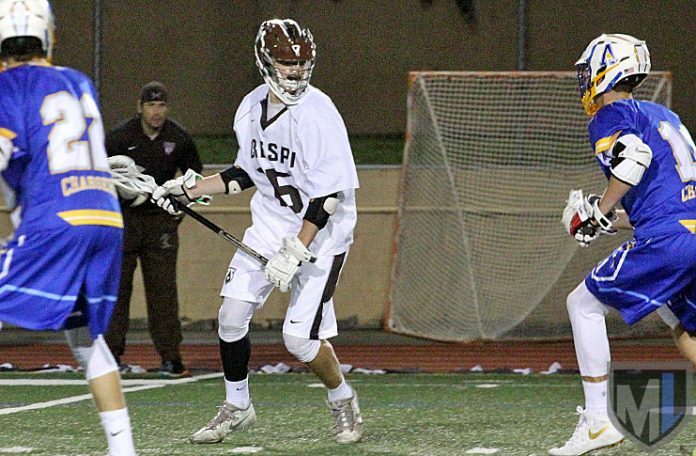 He scored one goal in Crespi’s season-opening loss to Agoura on Saturday. But top performances on the club circuit — and increased size and strength — since last season generated a lot of interest. Soelberg plays for Factory Lacrosse and the LA Heat and has attended events with Legends Lacrosse. Previously, he played for the Santa Monica Dragons. In January, Recruiting Rundown included him on a list of standouts from the Adrenaline Challenge. What made Maryland the right choice? What other schools did you consider or visit? What do you want to work on (or accomplish) in the next few years? Crespi coach Brock Livingston said Soelberg’s growth, both on and off the field, has been impressive. Livingston also noted that Soelberg is only a sophomore, and that Saturday’s season opener was only his 11th varsity game. He has a lot more games to play before heading to Maryland. Soelberg, voted one of four captains by his Crespi teammates, is the second Class of 2019 commitment from the LA area, following Oak Park middie Max Manyak‘s commitment to Notre Dame. Ryder Mora, a senior middie at Loyola, is committed to Maryland in the 2017 class.